Regarding: Racism and accessory to genocide. 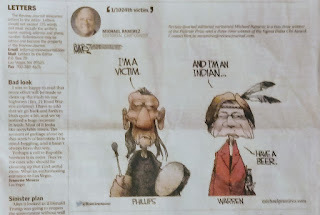 Yesterday, January 18, 2019, the Las Vegas Review Journal published a propaganda cartoon in derogation of Native Americans using a stereotype of Indian alcoholism. Racism is an abuse no matter how softly or funny media represent its abuse. The point is that media bias and racism kill Indians. In 1850, California passed An Act for the Protection and Governance of Indians that authorized Indian hunters to take Indian hands and scalps for $25 and make slaves of Indians found not working. Slaves were taken until they showed miners where the gold was such as in the case of a Shoshone tortured to give the location of gold at Rhyolite. Killing Indians was common and 60% of the Shoshone in California were killed within our own treaty country for not being white. The Act was not fully repealed until 1967. Before any settler or miner saw an Indian, media propaganda was there. Today, the media does not report Native American past exposure to radioactive fallout from US/UK secret nuclear testing and disproportionate burden of risk. The Shoshone people cannot endure any increased burden of risk from any source including resumption of WMD testing by US/UK, plutonium disposal from the Savanna River Site, depleted uranium disposal, proposed high-level nuclear waste disposal at Yucca Mountain, coal ash uranium or fracking released radiation. We should all be offended by genocide. 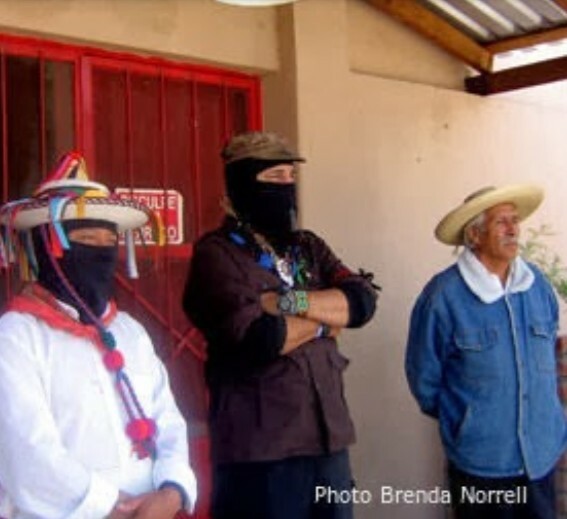 Beyond the historical pattern and practice of US abuse that may be genocidal, the Shoshone charge the US with violation of the UN Convention of Prevention and Punishment of Genocide in its recent submission to the UN International Covenant on Civil and Political Rights. Genocide is a crime in the US since 1988 (18 USC 1091) and there is no statute of limitation. In 1990 the US Department of Energy created the Yucca Mountain Cultural Resource Study protocol of "cultural triage" defined as, "the forced choice decision-making by an ethnic group to a development project." Triage is a word of French origin that means to sort or cull according to quality. Its normal usage is flood, famine, natural disaster and just declared wars. There is no flood, famine or natural disaster and peace endures by treaty. What the Shoshone people experience is a deliberate intent by the US to systematically dismantle the living life-ways of the Shoshone people for the benefit of the US and the profit of the nuclear industry. This meets the minimum threshold of genocide under both the UN Convention and the US enactments of the crime of genocide. The motive for the US to is to defraud the Shoshone people of our property. The intent to commit genocide is the culture of secrecy because we will never know what is killing Indians in secret. Biased media does not help protect the Shoshone people by providing unbiased information of importance to indigenous people so we can take protective action. Las Vegas Review Journal stop fanning the flames of hate and intolerance. We are all responsible for addressing genocide. I have never seen anything from Ramirez that disabuses me of the notion that he is just a right-wing stooge.